John Aloysius Stanaway was born 21 June 1881 in Helensville and was the ninth child of Henry and Rose Stanaway (Birth Certificate Number 1881/1988). We have no records of his early life but we could expect that it was much the same as his siblings and that of other children at that time in the area. On 11 March 1902 John, at the age of 22 years and 9 months, signed up with the Ninth Contingent for Service in South Africa – The Boer War. His Regimental number was 7849, Trooper, South Island Regiment – D Squadron. From his war records we see that he joined up in Dunedin, he was in Dunedin with his older brother Henry, his occupation was listed as a carter and his brother was listed as next of kin. From family accounts apparently he marched with the troops with his hat pulled down so he wouldn’t be recognised and reported as being under age. There is some discrepancy as to his age in his War Records. At the end of the Boer War the New Zealand Government was asked to send a contingent of soldiers to England for the coronation of Edward VII. Young, unmarried and tall John was selected to be part of this contingent. John was discharged after 240 days service. He received the South Africa 1902 clasp. In 1911 John marries Elizabeth Nora Rubie (Marriage Certificate Number 1911/3165). Elizabeth was born 22 September 1885 in Delhi, India. Nora was the youngest of 2 children of Philip Charles and Eleanor Rubie. Her father died in Madras, while Eleanor and the children lived in England at that time. After her father’s death her mother decided to move to New Zealand, Nora was about 15 years old when they arrived in New Zealand. Nora had been involved in two shipwrecks, the first was on the vessel Clan MacGregor on her way back to England, and then on her voyage to New Zealand the Ruapehu ran aground on Farewell Spit on New Years Eve 1900. Nora was very musical. John and Nora have three children – Philip John (1912), Mary (Molly) Patricia (1915) and Vincent (Military Medal WWII) (1918). Vincent was given no middle name because his parents didn’t get him christened as they were in Auckland at the time of the Spanish flu was about and would not risk taking him out – Vincent Paul Stanaway. Later in 1918 John and Nora moved back to Helensville with their three young children. John went to work for his brother-in-law, Wilfred Allen. The 1919 Electoral Roll has John living in Helensville and listed as a Grocer. The following Electoral Rolls in 1928, 1935, 1938 and 1946 all have John living in Helensville and listed as a Store Keeper (he ran a grocers). John and Nora started a grocery store next to the Star theatre in 1925. 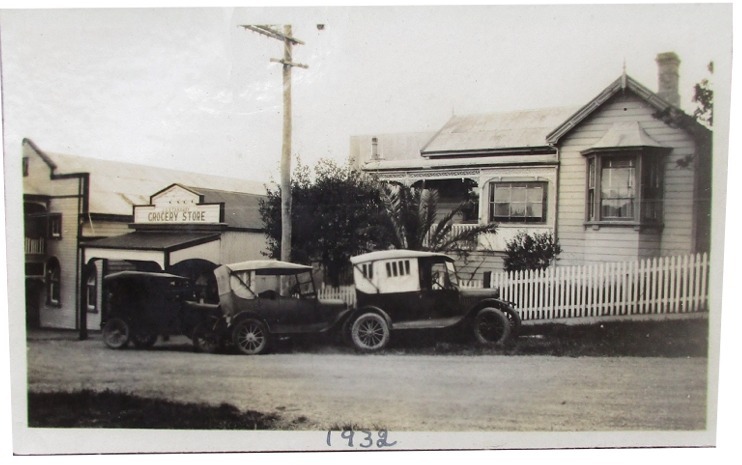 The Star Theatre, J A Stanaway Grocer and Becrofts residence – Vince Stanaway Collection. The Star Theatre which had seen the beginning of the Secondary Department of the Helensville District High School was razed in a fire which also consumed Mr. Jack Stanaway’s nearby grocery store around 4 a.m. on 21st September 1933…… The Star Theatre, the property of the A.O.F. Lodge, erected by Henry Stanaway for $357 on a site donated by Daniel Stewart in 1884, was never rebuilt…… Mr. J. Stanaway reopened his grocery business in Megson’s original store across the road and nearer the Awaroa River. Mr Stanaway had scarcely begun trade in his new store when Stewart Bros. sixty year old premises on the opposite side of Commercial Road were completely gutted by flames. They opened another store on the corner of Green Lane and Garfield Road in 1933, but were burnt out again in 1944. They then opened a small shop on the corner of the Regent Theatre – to keep the business until Vincent returned from WWII. 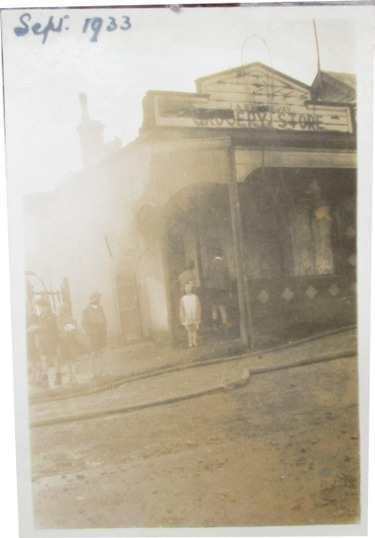 Another severance with Helensville’s past was caused by a fire in April, 1944, which completely removed all traces of the old store by Awaroa bridge, originally owned in the 1880’s by Joseph Megson and at the time of the fire, owned by Mr. Jack Stanaway, grocer. The hairdresser’s business which adjoined this store was also destroyed by the flames. Mr. Jack Stanaway, who had lost his previous grocery store by fire, was again a heavy loser, but undaunted, he set up a new grocery in the corner shop of the “Regent Theatre”. Later, Vincent Stanaway succeeded his father in this store and in 1949, this business was sold to R.J.Pickering. As Chairman of the Helensville Town Board, the welcoming speeches at these functions were made by Mr. Jack Stanaway, the only man known to have left from Helensville to fight in the Boer War and the father of a young soldier, Vincent Stanaway. He was a member of the Helensville Town Board from 1938 – 1946 and chairman of the board from 1941-1944. John passes away 1 October 1946, in Helensville (Death Certificate Number 1946/35064). He is buried in the Helensville cemetery Row 13 plot 400 aged 65 years. Nora out lives her husband by 21 years, and is buried in the same plot in 15 January 1967, aged 82 years (Death Certificate number 1967/24055). Nora played golf, tennis and croquet, was president of the Women’s Auxiliary during the war and was a Life Member of the Women’s Section of the RSA. She was also a member of the Helensville Musical and Dramatic Society and the Woman’s Institute and very active in St Joseph’s Church where she was organist at one time. Elizabeth Nora Stanaway – Helensville Museum. John (Jack) Aloysius Stanaway – Helensville Museum.